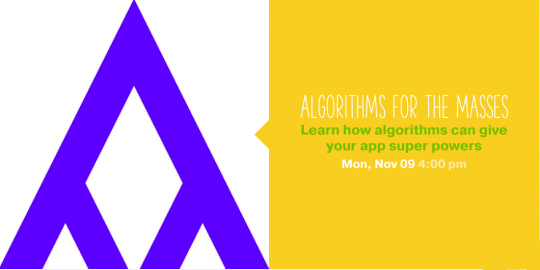 Join Algorithmia on Monday, November 9th at 4pm for a discussion on the power of algorithms at Startup Hall, and how you can build next generation apps using machine learning, natural language processing, computer vision, and more. We’ll discuss how algorithms can power intelligent platforms, and create personal, context-aware interactions you can use to turn dumb data into smart applications. RSVP Here. Algorithmia is the largest marketplace for algorithms in the world, enabling developers to rapidly build and deploy production-ready, serverless applications in minutes. With Algorithmia you have access to world class algorithms in five lines of code or less. Leverage algorithms to recognize patterns in data, extract visual knowledge, understand audio, classify unstructured data, and derive meaning from language, all via a REST API.